With spring in the air, so is pollen. 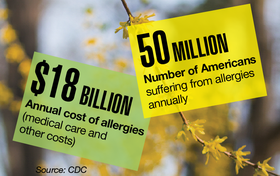 Allergy sufferers from coast to coast, get ready. AccuWeather reported that some parts of the country are already seeing the highest pollen counts ever recorded. Download the PDF.